In the lead story in this issue of The Four Hundred, I walked you through the basic structure and the high-level sales pitch for the new PureSystem family of converged platforms announced by IBM last Wednesday. That gives you the view from 30,000 feet with a couple of buzz dives down but still well above the tree tops. Now it is time to take a good hard look at the new iron. We’ll start with the Flex System chassis at the heart of the PureFlex and PureApplication machines and the three server nodes that slide into its bays. But first, let’s take a look at the chassis, which is discussed in announcement letter 112-053. The Flex System chassis is 10U high and a full rack deep. About two-thirds of its depth in the front of the chassis is for the server and storage nodes and the back one-third of the space is for fans, power supplies, and switching. The compute and storage are separated from the switching, power, and cooling by a midplane, which everything links to in order to lash the components together. In this regard, the Flex System is just like a BladeCenter blade server chassis. But this time around, the layout of the machinery is better for real-world workloads and the peripheral expansion they require. The 10U chassis has a total of 14 bays of node capacity, which are a non-standard height at 2.5 inches. The key thing is that this height on a horizontally oriented compute node is roughly twice the width a single-width BladeCenter blade server. That means you can put fatter heat sinks, taller memory, and generally larger components into the Flex System compute node than you could get onto the BladeCenter blade server. To be fair, the BladeCenter blade was quite taller, at 9U in height, but you couldn’t really make use of that height in a way that was constructive. As the world has figured out in the past decade, it is much easier to make a server that is half as wide as a traditional rack than it is to make one that is almost as wide and twice as thin. And it is much easier to cool the fatter, half-width node. That is why Cisco Systems, Hewlett-Packard, Dell, and others build their super-dense servers in this manner. And while the iDataPlex machines from IBM were clever in that they had normal heights, were half as deep, and were modular, like the Flex System design, the iDataPlex racks were not standard and therefore did not layout like other gear in the data center. (Instead of one rack with 42 servers in a 42U rack, you had 84 servers in a half-deep rack with two racks side- by-side.) This creates problems with hot and cold aisles, among other things. The PureFlex System rack, which you can see in announcement letter 112-084, is a normal 42U rack with some tweaks to play nice with the Flex System chassis. You can get more feeds and speeds about the chassis in announcement letter 112-053. The chassis has room for 14 half-wide, single-bay server nodes or seven full-wide, two-bay server nodes. You will eventually be able to put four-bay server nodes and four-bay storage nodes inside the box, with them plugging into the midplane, or you can continue to use external Storwize V7000 NAS arrays if you like that better. While a single PureFlex System can span four racks of machines and up to 16 chassis in a single management domain, you need to eat at least one slot in one of those racks dedicated to the Flex System Manager appliance, which does higher-level management of servers, storage, and networking across those racks. IBM’s Flex System chassis, rear view. The idea is to add server and storage nodes in the front from the bottom up and to add power and cooling modules from the bottom up as well. You can have up to six 2,500 watt power supplies and up to eight 80mm fan cooling units for the compute and storage nodes. There are no fans on the nodes at all–just these fans, which pull air from the front of the chassis, which sits in the cool aisle in the data center and dumps it into the hot aisle. There are four separate 40mm fans for cooling switch and chassis management modules (CMMs), which slide into the back of the chassis. IBM is using its own Gigabit and 10 GE switches (thanks to the acquisition of Blade Network Technology) and Fibre Channel switches from Brocade and QLogic and adapters from Emulex and QLogic. It looks like IBM has made its own 14-port InfiniBand switch, which runs at 40Gb/sec (quad data rate or QDR) speeds and is based on silicon from Mellanox Technology, as well as adapters from Mellanox for the server nodes. Here are the mezz card options: two-port QDR InfiniBand, four-port Gigabit Ethernet, four-port 10 Gigabit Ethernet, and two-port 8Gb Fibre Channel. You can also run Fibre Channel over the 10 GE mezz card. You can see the two Power7 processor sockets on the left, the main memory in the middle, and the I/O mezzanine cards and power connectors that hook into the midplane on the right. IBM is supporting a four-core Power7 chip running at 3.3 GHz or an eight-core chip running at either 3.2 GHz or 3.55 GHz in the machine. Each processor socket has eight memory slots, for a total of 16 across the two sockets, and maxxing out at 256 GB using 16 GB DDR3 main memory. The cover on the server node has room for two drive bays (that’s clever, instead of eating up front space in the node and blocking airflow). You can have two local drives–either two 2.5-inch SAS drives with 300 GB, 600 GB, or 900 GB capacities or two 1.8-inch solid state drives with 177 GB capacity–in the node. These local drives slide into brackets on the server node lid and tuck into the low spot above the main memory when the lid closes; the lid has a plug that mates with the SAS port on the motherboard. One important thing: If you put the local hard 2.5-inch disk drives in, you are limited to very-low-profile DDR3 memory sticks in 4 GB or 8 GB capacities. If you put in the 1.8-inch SSDs, you have a little bit more clearance and can use 2 GB or 16 GB memory sticks that come only in low-profile form factors and are taller. So to get the max capacity in the node, you need to use no disks or SSDs locally. The Flex System p460 server node did get its own debut, in announcement letter 112-017, and is essentially two of these p260 nodes put side-by-side on a double-wide tray and linked with an IBM Power7 SMP chipset. 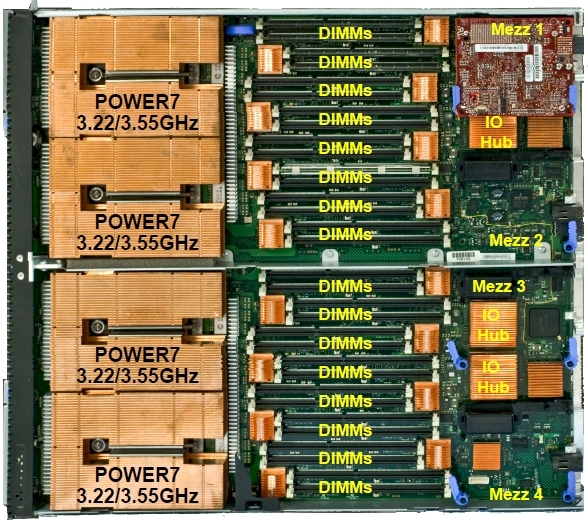 (It is not entirely clear where IBM hides this chipset, but it is possible that the Power7 architecture supports glueless connections across four processor sockets.) In any event, you get four sockets with the same Power7 processor options, with twice the memory and twice the mezzanine I/O slots because you have twice the processing. Just like the Power 740 and 750 rack-mounted machines, the Flex System p460 node is going to be overkill for a lot of IBM i customers. I am hunting down information to see what the pricing is on these nodes and what their IBM i software tier will be. But generally speaking, Steve Sibley, director of Power Systems, says that the performance of the p260 and p460 nodes will fall somewhere between the PS 7XX blade servers and the Power 730 and 740 servers and the bang for the buck will be somewhere in between there as well. The PS 7XX blades were relatively attractively priced, of course, overcompensating maybe just a little bit for the lack of expansion on the blades and the extra cost of the blade chassis and integrated switching. As best I can figure, IBM was hoping to launch the Flex System chassis along with Intel’s “Sandy Bridge-EP” Xeon E5-2600 processors last fall, in the wake of an expected announcement by Intel maybe in September. But Intel pushed out the launch (due to an issue with the on-chipset SAS controller that was supposed to run at 6 Gb/sec but which was geared down to 3 Gb/sec before its launch) and that left IBM either leading with Power7 nodes and talking about Xeon nodes, quickly slapping together an Opteron 4200 or 6200 node based on the chips from Advanced Micro Devices, or waiting. IBM chose to wait. It is not clear if IBM will ever do an Opteron based node, AMD’s advantage with the 4200 and 6200 processors over the Xeon E5-2600s (and the forthcoming Xeon-2400 for cheaper and less expandable two-socket machines) is nil when it comes to number crunching and not huge when it comes to supporting large numbers of virtual machines. AMD may have a price advantage, but there may not be enough pull in the market for IBM to invest the engineering effort. I think there is no question that Big Blue will offer multiple Xeon-based nodes for the Flex System chassis, including a two-bay machine delivering four sockets based on Intel’s upcoming Xeon-E5-4600 processor, and maybe even a four-bay machine based on a future Xeon E7 processor with four or eight sockets and offering much larger main memory and expansion for the node. I think it is a no-brainer that the Flex System will very soon support Nvidia Tesla GPU co-processors for supercomputer customers, too. A four-bay, eight-socket Power7 node is also a possibility, and with such a configuration, IBM could cover the bulk of its Power Systems customers in either AIX or IBM i customer bases. The Power7 nodes in the Flex System support IBM i 6.1 and 7.1, AIX 6.1 and 7.1. The Flex System x240 node is a two-socket box, with is really the only option with the Xeon E5-2600 chips. IBM is offering the full slate of Xeon E5-2600 processors (which I wrote about in detail here) for the machine, ranging from parts with low core counts and low prices to ones with low core counts and higher clock speeds and relatively high thermals to chips with six or eight cores with standard thermals and burning 95, 115, or 130 watts to the top-bin E5-2690 which has eight cores, 16 threads, runs at 2.9 GHz, and burns 135 watts. This is probably the thermal zone that the eight core, 3.55 GHz Power7 processor is in, by the way. Which is why they can be crammed into the same space in a Flex System rack with generally the same system features. I think further that IBM needs to get Power7+ processors into the field soon sporting LR-DIMM memory support and if not on-chip PCI-Express 3.0 support, then at least some way to hang PCI-Express 3.0 slots off the GX++ bus on the Power chips. IBM needs to draw even with Intel on the feeds and speeds and slots and watts. IBM has two 10 GE ports welded onto the motherboards, which means they don’t eat a mezzanine card slot. Rather than putting the 2.5-inch disks under the server node lid, the x240 has two hot-swap disk bays in the front of the bay. IBM is supporting either SAS or SATA disk drives or SSD flash drives in a 2.5-inch form factor for this server node for local storage. SAS drives come in 146 GB, 300 GB, 500 GB, 600 GB, 900 GB, and 1 TB capacities at various rotational speeds; SATA disks come in 250 GB, 500 GB, 1 TB capacities; and SATA SSDs come in 50 GB, 128 GB, 200 GB, and 256 GB capacities. There’s also a redundant pair of internal USB ports for storing VMware ‘s ESXi hypervisor on baby flash units. The x240 node has the same two mezzanine cards and options as the p260 node.